26 oz. Stainmaster BCF Type 6,6 2-Ply Premium Nylon (High-twist, heatset nylon maximizes appearance retention and resilience. Bound and serged for maximum durability. Softflex Backing system. ANTI-STAIN/ANTI-SOIL Protection with Lotus FX Fiber Shield - Rug stays up to 30% cleaner and lasts up to 50% longer. Sheds Liquids, soil particles and food and beverage stains. ANTIMICROBIAL Protection with Impervion - Uses the power of silver to protect against bacteria, microbes and odor. Maintenance: Spot clean with approved carpet cleaner. Follow manufacturer recommendations. Vacuum regularly. Hot water extraction. 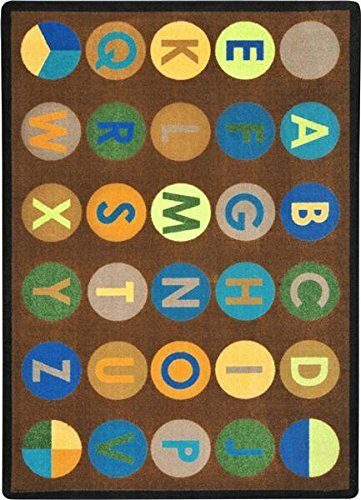 Nalahome Modern Flannel Microfiber Non-Slip Machine Washable Round Area Rug-cor Bingo Game with Ball and Cards Pop Art Stylized Lottery Hobby Celebration Theme Multi Area Rugs Home Decor-Round 63"